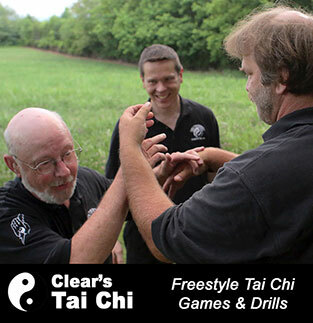 Clear’s Tai Chi Online is an in depth training program from beginner to advanced. As soon as you sign up you’ll get instant access to the complete Levels 1 & 2 curriculum along with bonus seminars and workshops. Click Here to begin your Clear’s Tai Chi Training. Clear’s Tai Chi Level 1. 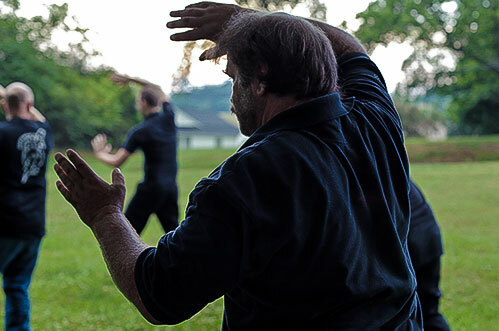 Learn the fundamentals of Tai Chi, earn the Clear’s Tai Chi Level 1 certification and build a strong foundation for intermediate and advanced Tai Chi skills. Level 1 has been re-filmed in HD and updated with more in-depth instruction. It contains over 22 hours of instruction. The old level 1 footage is also available. It contains over 11 hours of instruction and is an excellent resource for instructors who are running their own level 1 class. Learn the intermediate and advanced Tai Chi skills of a Clear’s Tai Chi Black Sash Instructor. Study Clear’s Tai Chi from beginner to advanced. Level 2 contains over 37 hours of instruction available as soon as you log in. We are currently re-filming level 2 in HD with new lessons added every month. Levels 3 & 4 are only available after you earn your Level 1 & 2 certifications. You will need an internet connection to view this course. You’ll be able to view these lessons in all major browsers and on most mobile devices. All Sales are final. There are no refunds. However if you have any technical trouble let us know right away. Q. Will I get a set of DVDs with this order? A. No, this is a completely digital course. Nothing will be shipped. Q. What kind of computer & software do I need? A. You need a computer, smartphone or tablet with an internet connection. We support all major browsers and most mobile devices. Q. Can I use my Smart Phone / Tablet / mobile device? Q. Can I download lessons to my computer for offline use? A. No, lessons are only available online with an active internet connection. I unfortunately can’t afford $47 per month. What order should I buy the dvd’s for Tai Chi? May I ask style Tai Chi you are teaching . At this time I am studying Yang style. The style is Clear’s Tai Chi. Though we focus on core principles that are universal to most Tai Chi styles, and Sigung Clear has studied with masters in all the major Tai Chi styles, the strongest stylistic flavors you will see are Yang and Wu. Sigung Clear’s primary Tai Chi lineage is Yang style through Lee Ying Arng. Sigung Clear has also studied with Wu masters including Ma Yueh Liang and their influence is infused in what we teach as well. Is this the same curriculum as the Combat Tai Chi course I can purchase on DVD, or is it different? Would I learn more from buying the Combat Tai Chi DVD course? This is different than the Combat Tai Chi DVDs. 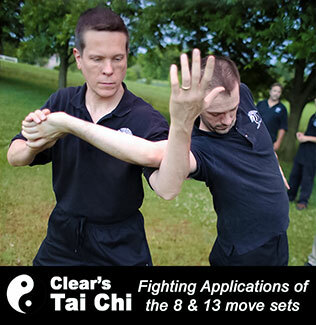 The Combat Tai Chi DVDs focus strictly on how to fight with the different moves and internal principles of Tai Chi. This course is a study of Tai Chi as whole and focuses on core internal principles and how they are applied for both health and martial. It does include fighting stuff but it doesn’t get into as quickly or directly as the Combat Tai Chi DVDs. I have an account already but only use it to check out the site. I have not paid anything yet to view any of Sifu Clear’s products… I would like to check out the $5 – 14 day trial offer for the Taichi course… is that possible…?? I can’t seem to land any payments via paypal correctly for it…. The new member site is open for enrollment. You can do the 14 day trial here (up above). Does the Internal Iron Palm/ Cotton Palm part of the online course cover as much as the ‘Internal Iron Palm’ DVD does? Or is it purely on Cotton Palm? Is the online training material the same as the dvds? In other words does the online training consist of the dvds broken up into lessons? If different, what is the difference? Thanks! Some of the DVDs are available as lessons online, while many are not. All of the Level 1 DVDs are online, and a lot of the Level 3 (Combat Tai Chi) DVDs are on there as bonus material. The online program also includes our Level 2 Tai Chi material, which is not currently available on DVD and might not ever be. We are constantly filming new Level 2 material, and we put it online as fast as we can. We have approximately 22 hours of our updated Level 2 instruction available, and we are only about 1/4 through the curriculum. If that were to be made into DVDs, we estimate it would be a 60+ DVD set. We also have all the old Level 2 footage up for you to see. Another benefit of online membership is that you get access to the Silat/self-defense material as well. We have not launched this program officially yet, but we have most of Phase 1 and Phase 2 available already, and we will start filming Phase 3 soon. We allow our live students to attend both Tai Chi and self-defense classes, so we give our long-distance students access to both programs as well. I hope that helps answer your questions. Good luck with your training! Does this “have” all the things that are taught in the DVD’s? That said, you do have access to all of the Level 1 and Level 2 videos we have posted so far, so for those with a little more Tai Chi experience under their belts the material can be tailored to their needs. There are also Test Reviews included with each major section, so you know exactly what skills you are expected to know and demonstrate from each chunk of the material. We wanted to make this structured enough so that a beginner could easily follow it, yet flexible enough so that it could be customized to your needs. Tai Chi is a fluid art, and the way you train it should be highly personalized. This course offers the freedom that students need in order to make their training efficient and effective, yet has the necessary structure in place for making measurable progress. I come from a Shotokan background as well! If your goal is to build Internal Power through Tai Chi, I would recommend you start with our Level 1 course. Don’t be fooled by it’s name. This course is the exact same curriculum that we make our live students do (they typically test in 3-6 months), and it is the main reason that our system gets results so quickly. This will give you a solid foundation in Internal Power, it can be practiced almost entirely solo, and it is included with an online membership. After that you can proceed directly to our Level 2 courses. There are five modules in the Level 2 curriculum, each one covering about as much material as the Level 1 course. Level 2 access is also included with an online membership, and there are a whole bunch of bonuses from the Combat Tai Chi course that would be right up your alley. It sounds like the Tai Chi Online program would be the logical first step for you. As you go, if there are specific topics that you want to work on outside of or in addition to the regular curriculum, chances are good that we have specific training on the subjects you are interested in. In that way you can supplement your training to get results tailored to your goals.